From the author of The Calligrapher's Daughter comes the story of two sisters—one raised in the United States, the other in South Korea—and the family that bound them together even as the Korean War kept them apart. ...heartfelt ... Though the ending seems a bit rushed, as the sisters go off to college and enter their twenties, Kim is a true storyteller, and her latest work is engaging throughout. Readers who enjoy family sagas by Lisa See and Jamie Ford will appreciate this one. Covering such a broad span of history is an ambitious undertaking, and The Kinship of Secrets is not without its stumbles. While at times the author’s prose tells more overtly than it shows, she’s able to capture an abundance of feeling. Drawn from her own family history, Kim’s story unfolds with the weight of lived experience. Through these relationships, The Kinship of Secrets explores the meaning of love and sacrifice and how often they are one and the same. Kim’s...second novel is a timely and moving historical saga ... [a] heartfelt story, one which will greatly appeal to readers who enjoy the multicultural novels of Lisa See and Amy Tan, stories that enlighten as well as entertain. What did you think of The Kinship of Secrets? 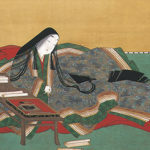 An art exhibit on The Tale of Genji. Roxane Gay and Tressie McMillan Cottom's new podcast. The power of translating stories of the Armenian diaspora. Rachel Syme on writers’ daily routines.